The Rise of Hard Cider, Part 2: How is Hard Cider Made? Hard cider is making a comeback in the American adult beverage market, and at Bernick's, we're helping our customers stay on-trend with the ever-expanding cider market. In a recent blog post, I explained the basics of this classic fruit-based fermented drink; but today we'll dig a little deeper into the nitty-gritty of cider production, the variations of cider-making processes, and what differentiates cider from beer. Hard cider starts with apples - lots and lots of apples! The variety used varies with each brand and region and in order to make truly good cider, you need apples with a lot of sugar — to encourage fermentation — and particular levels of acid and tannins. You won’t find these cider apples at the grocery store because eaten as fruit - they taste terrible. Once the tree-ripened cider apples are harvested, they are thoroughly washed and pulverized using large industrial shredders, transforming the fruit into a mushy pile of apple pulp goodness. This pulp is then smashed, mashed, and squeezed to extract as much juice as possible - this pure, unfiltered apple juice is then placed into large fermenting vats where sugars and yeasts can be added to moderate the flavor and alcohol content of the cider. Many cider makers use stainless steel fermentation tanks, while others employ oak barrels to impart a wood-sy flavor and complex tasting notes into their final product. If apple juice concentrate is also used, it gets stirred into the fermenting vats along with the fresh juice. In the United States, all hard cider must contain at least 50% fresh apple juice (the balance can be made from juice concentrate). The fermentation vat must be carefully monitored to ensure no air enters, as oxygen will cause the apple juice to turn into vinegar. Many cider makers pump inert gases into their processing tanks to push out any unwanted air. Most hard ciders are fermented for many months (and in some cases, years). During this time, the sugars in the apple juice transform into alcohol; once the desired alcohol content is reached, the hard cider is decanted and bottled for consumers to enjoy! How Is Hard Cider Different From Beer? While both hard cider and beer are fermented using yeasts and bottled for consumption, the similarities between these popular brews end there. Hard cider is made from two simple, natural ingredients - yeast and apples. It's gluten-free, preservative-free, and high in antioxidants such as Vitamin C. Cider is also high in sugar, and can be a bit higher in alcohol than beer on an ounce-by-ounce basis. Unlike beer making, nothing is removed from the hard cider during the brewing process, and it's doesn't have the traditional 'head' that beer does. By contrast, beer is packed with gluten and brewers often skim off the naturally-occurring antioxidants which can make the beer look cloudy. Beer is generally much lower in alcohol content vs. hard cider, and it's also lower in sugar (and calories). 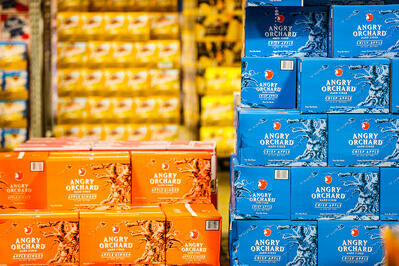 In terms of how it's made and the final product, hard cider is actually more similar to wine than it is to beer. How Do Hard Ciders Differ? Hard cider makers each impart their own signature twist on their processes, making for some tasty and interesting variations among each brand! Some hard ciders are made in traditional breweries with methods similar to beer making, while others are made in actual cideries and some even in wineries. The apple varieties used, the blend of the juices and the addition of yeasts, sugars and other fruits all make each brand of hard cider unique; some cider brewers even ferment their brews in oak barrels, while others have begun experimenting with crafting 'aged' hard ciders.